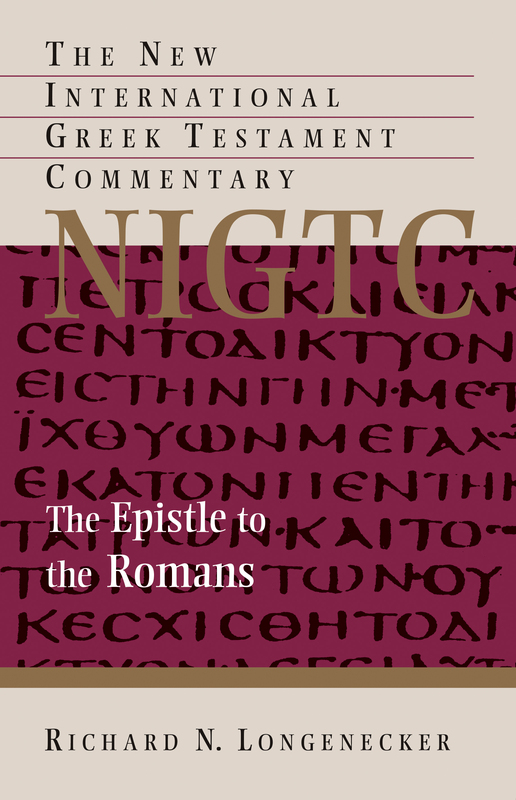 The following is an excerpt from the introduction to The Epistle to the Romans (NIGTC) by Richard N. Longenecker. Contrary to what has traditionally been argued, it is the thesis of this commentary that the focus or central thrust of Paul’s presentation in Romans is not to be found in the first section of the body middle of the letter, that is, not in 1:16–4:25 — and not even in 1:16-17 combined with 3:21–4:25 — but, rather, (1) that Paul’s focus or central thrust is set forth in the second section of the body middle of the letter, that is, in 5:1–8:39,29 and (2) that the corollary of this focal theological exposition in 5:1–8:39 is expressed in the rather general — though also, it needs always to be recognized, the much more expressly christocentric — ethical exhortations of the fourth section of the letter’s body middle, that is, in 12:1-21 and 13:8-14. So we will argue that it is in 5:1–8:39 that the theological portion of Paul’s “spiritual gift,” which he said in 1:11 he wanted to give to the Christians at Rome and which he calls in 2:16 and 16:25 “my gospel,” comes explicitly to the fore — with the more general, but decidedly christocentric, exhortations of 12:1-21 and 13:8-14 comprising the relevant ethical materials that function as corollaries to the theological materials in 5:1–8:39. This is not to discredit what Paul writes in 1:16–4:25, for that is what he held in common with his Christian addressees at Rome. Indeed, it was probably on the basis of the truths of 1:16–4:25 that both he and his Roman addressees originally became believers in Jesus. Certainly he believed that what he wrote there was true and highly significant, both in what he argued against and in what he affirmed. In all likelihood, Paul himself had proclaimed in other contexts much of what he argues there, particularly when presenting the Christian gospel to Jews in the synagogues of the Jewish Diaspora (as represented in Acts) as well as when writing to Gentile Christians who had been influenced by Jewish Christian thought for the better, as had his addressees at Rome (or when writing to his Gentile converts in the province of Galatia who had been influenced by Jewish Christian thought for the worse, as he did earlier in his missionary career). But what Paul wanted the believers in Jesus at Rome to know, and therefore what he had a particular desire to present to them in 5:1–8:39 (together with the ethical implications of that exposition as expressed in 12:1-21 and 13:8-14), was the message of the Christian gospel as he had contextualized it in his preaching to those who were ethnically Gentiles and without any preparatory religious knowledge gained from either Judaism or Jewish Christianity — that is, to those who had for all their lives existed apart from any understanding of the Jewish (OT) Scriptures. For the Christians at Rome were dominantly Gentile believers in Jesus, and so, however they had originally come to Christ, Paul viewed them as included within his God-given mandate to Gentiles and therefore within the orbit of his Gentile mission. Thus he desired to strengthen these Gentile believers in Jesus by proclaiming to them his own distinctive form of Christian proclamation. Further, he wanted these Christians at Rome to become partners with him in his further missionary outreach to Gentiles in the western regions of the Roman Empire, just as the Christians at Antioch of Syria had supported him in his missionary outreach to Gentiles in the empire’s eastern regions. The Christians at Rome, whether ethnically Jews or Gentiles, were all, it seems, very familiar with the biblical accounts of God’s redemptive working within the nation Israel. Likewise, it may be presumed that they were knowledgeable about the theological and ethical teachings of the OT Scriptures. It may, therefore, be postulated that the foundational salvific story of Israel’s exodus from Egypt — as well as the Jewish soteriological themes of “justification,” “redemption,” and “sacrifice of atonement” (“propitiation” or “expiation”) — would have been important to them. But what Paul seems to have discovered in his missionary outreach to Gentiles of the Greco-Roman world was that the story of the exodus and such forensic religious expressions as justification, redemption, and propitiation/expiation — while of great importance in Jewish and Jewish Christian contexts — were largely unknown, without significance, and probably not particularly appreciated by Gentiles who had no Jewish or Jewish Christian background. So in his preaching to Gentiles, Paul, it may be postulated, would have felt it necessary to contextualize the message of the Christian gospel in a manner that he believed would be more intelligible, personal, and significant to them — that is, (1) by speaking of “peace” and “reconciliation” with God “through our Lord Jesus Christ” (5:1-11), (2) by explicating the more universal, foundational story of how sin, death, and condemnation entered the world by “one man,” but how grace, life, and righteousness have been brought about “through Jesus Christ our Lord” (5:12-21), (3) by spelling out relations between sin, death, and the law, on the one hand, and grace, life, and righteousness, on the other (6:1–7:13), (4) by expressing the plight of all people in their attempts to live by their own insights and strength by the use of a familiar tragic soliloquy drawn from Greek literature and by reference to humanity’s common experience (7:14-25), (5) by highlighting the new relationships that come about when one is “in Christ” and “in the Spirit” (8:1-30), and (6) by closing with a triumphal declaration of God’s love and care for his own “in Christ Jesus our Lord” (8:31-39). And it is this same type of contextualization, with the highlighting of many of these same features and themes, that appears also in a number of his other NT letters where Gentile believers in Jesus are addressed directly — as, for example, in 2 Cor 5:11-21 and Eph 2:1-22.